Club Penguin Cheats by Mimo777 Club Penguin Cheats by Mimo777: Club Penguin Helping Reviewed By You! "In our local comunity I help find lost pets and look after stray animals. In Club Penguin I help penguins who don't know how to do stuff. I also try to help resolve disagreements. Its really great to hear the money we raised has made a difference! Waddle on! & have fun!" For next week, Club Penguin wants to know what your favorite part of the Cave Expedition was? Really? That's all? Come on Club Penguin tell us something exciting! Where are the Sneak Peeks we used to get? Who's with me? TONS of new Flash Games here! We want sneak peeks! They were posting sneak peeks ONCE A WEEK! Now..? Oh, come on CP! yeah cp!!! what gives?! WE NEED SNEAK PEEKS! maybe we should start a campaign for how boring cp gets sometimes although i have to say... the underground thing was pretty cool but too bad it wasnt for non members too. they should have at least SOME non peeps stuff! P.S. i just set up a blogger thingy, check it out pleeeease!!! nice review! oh come on cp! u have to giv us some sneak peeks! I agree Mimo! C'mon CP! Me Bullet! 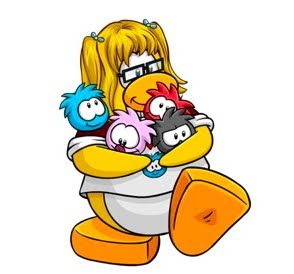 Me really want Club Penguin to have Sneak Peaks! Me mad! Yeah Safa. Totally agreeing with you on that one. ........ We do NEED a new sneak peak. Is CP......!? No. Nevermind. i'm with you mimo! Why can't it be like the good old days! and i'm not ill anymore! Hooray! I know you know this from years of experience but please remember not to put MEGA MIMO MOD unless you are modding. Even though getting that far up is impresive! Kkkkkk123 (CPG MOD) GO CPG12! I really agree like if you knew what your birthday presents were would you be suprised when you opended them,it's the same thing. i agree with something so big coming up why dont we have a sneak peek! Sneak peeks are needed CP!Lol we all agree with you Safa153! Lol, i totally agree with you sprocket07! Yeah I agree too! Please remember NOT to put (CPG MOD) after your name when you are not modding.! Thank You! Cool... Thanks for the... um... what was it called again? Oh yeah! The reviwed by YOU! LOL! Im not getting my 100% daily value of sneak peaks! How about a sneak peek at the Febuary party? After all the Winter Olympics are in Febuary. I agree-Sneek peeks should come more often. I'm always the kind of person who dislikes sitting and waiting! Even though the sneek peeks come less now, lets use our imagination and guess what it will be! Hmmm-For the Winter Olympics maybe there will be a CP olympics, like before, And Hopefully Cp will bring the medals back! yeah! I want sneak peaks! As many of us have already done... you can try e-mailing Club Penguin with any questions, issues, etc. They will usually respond within 2 days (although it took them a month to respond to me) and usually say that they will your request onto their development team. In case you are wondering, Club Penguin has to fund all of the events they plan, and use some of the member money to do so... they do this as opposed to advertising... so that's that!!! Yeah!! After all, weren't there Penguin Games in the Summer of '08? What about Winter Penguin Games???? ?